How Much is a Pin Worth? The economic value of a Pin is growing, which means that retailers who have neglected building their presence on Pinterest are undoubtedly missing out on revenue. In fact, a new report from social marketing and analytics platform Piquora reveals that a Pin generates 78 cents in sales on average, which is a 25 percent increase from 64 cents in Q4 2012. Moreover, the data shows that a Pin drives two site visits and six page views on average, while orders driven from the social network tend to peak on Mondays. This is likely because weekend browsing behavior helps move consumers through the purchase funnel, leading them to complete purchases at the beginning of the workweek. The study also shed light on the lifespan of Pins, revealing that 50 percent of website visits from a Pin happen 3.5 months after the image is pinned. Furthermore, 50 percent of orders happen 2.5 months after an image is pinned. This proves that Pins have a long life, which is likely because Pinterest’s Search feature is good at turning up results for older pins while the network’s “Today” page offers fresher content. It is also important to note that on average, a Pin generates more than 10 Repins, which makes Pins 100 times more viral than tweets. 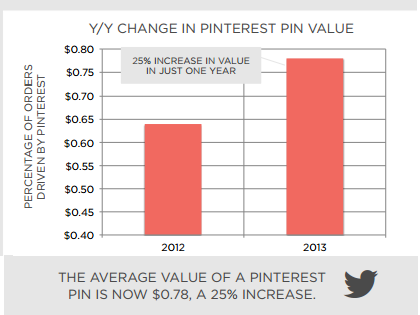 Plus, Rich Pins perform even better, with data showing they are repinned 82 percent more often than regular Pins. When it comes to average order value (AOV), however, the study notes that Pins less than a week old have AOVs that were 18 percent higher than pins that were one month old and 37 percent higher AOVs than pins that were 60 days old. That said, after 60 days, the study shows that AOV tends to plateau at around $50. Knowing this info, Piqora also offers some tips for Pinterest brand marketers. For instance, the company recommends pinning often and pinning on the weekends when the site’s traffic numbers tend to peak. In addition, Piqora suggests that retailers coordinate their merchandising to make sure important items remain in stock. This is especially important since half of orders driven by Pinterest are placed 2.5 months after the original Pin is uploaded.